Mutants – those beings born with natural super powers – once represented the future of humanity. But as a wise man once said, “the future isn’t what it used to be,” and various circumstances have reduced the number of mutants world-wide to just about 200. Most of them now live on an artificial island dubbed Utopia, located just off the coast of San Francisco. With Mutantkind in such dire straits, their de facto leader, Scott Summers (a.k.a. the X-Men leader Cyclops), intends to go before the United Nations and ask for the recognition of Utopia as a peaceful nation. More, he plans to ask for the destruction of any weapons technology that specifically targets mutants. An attack on the UN by a telepathic mutant terrorist leaves the rest of the world largely unsympathetic and leads to a run on the sale of Sentinels, the robotic assassins built exclusively to hunt and kill mutants. This is all according to the machinations of Kade Kilgore, a young munitions magnate and owner of most of the world’s remaining Sentinels. As Kilgore’s plans develop, the X-Men find themselves stretched increasingly thin trying to protect a world that hates and fears them from an army of malfunctioning Sentinels. And as the threat of total destruction builds and Cyclops forces more and more young mutants into battle, Wolverine will find himself taking a stand against his leader and starting a fight for the future of Mutantkind. I’ve never been a big X-Men fan. In fact, it would be fair to say that I believe that X-Men comics in general are the epitome of everything that is wrong with American superhero comics. The storylines are dominated by characters who had far more thought put into their powers than their personalities. You need to read more than a doctoral student working on her thesis to have even a basic grasp of the continuity. And on the rare occasions a creator tries to do something unusual or thoughtful with the concept (I’m thinking Grant Morrison’s New X-Men or Joss Whedon’s Astonishing X-Men), the fandom revolts and demands more of the same epic storylines where Everything Changes Forever. X-Men: Schism is guilty of all of these generalizations. And yet, I found myself enjoying it anyway. The story Jason Aaron tells here is remarkably accessible, despite being mired in some complex continuity. While most of the supporting cast doesn’t get much definition and there are a few bits where only long-time X-Fans will get the joke, the action flows well and Aaron takes the time to show off the hidden paternal side of the team badass, Wolverine. Indeed, some of the best scenes in this story involve Wolverine and his efforts to try and give some sense of normalcy to the life of a 14-year-old girl who considers herself a monster because of her powers. While the script flows well enough, the art doesn’t always aid the story. 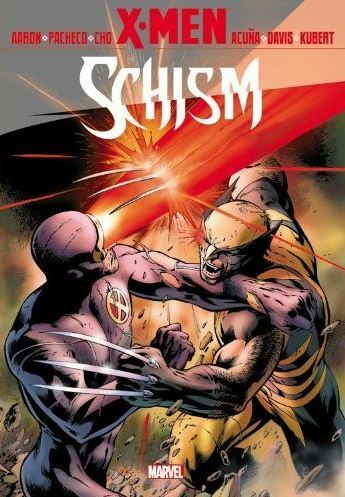 Each of the five chapters of X-Men: Schism is drawn by a different artist, each of them possessing a completely different style. They are all good artists, but the differences seem jarring at times as the story transitions from one scene to another. Kieron Gillen, who wrote the final issue in this TP collection, fares somewhat better in his story, detailing how the two factions of mutants are formed in the wake of the titular schism. There are a lot of effective character moments here and some good humor. Sadly, the artistic metaphor of the B-story of this chapter – an odd sequence depicting the various X-Men as a tribe of cavemen rallying around two of their fellows battling for supremacy – seems to be less about tribalism as a metaphor for the current state of the Mutant population taking sides with either Cyclops or Wolverine and more about giving artist Billy Tan a chance to draw the X-Men as fur-clad barbarians. Despite this tiny bit of fan service and the general sense that we’ve seen a lot of this story before in various pieces (Wolverine bonds with a troubled teenage girl, Wolverine fighting Cyclops, the return of The Sentinels, etc. ), I’d still recommend this book. It isn’t the greatest X-Men story ever written, but it is a must-read for those who wish to know the current status quo of the team. It is good for what it is, a well-paced action flick on paper.